This article is about the American TD. For the Soviet medium tank, see T-28. El tanque superpesado T28 fue un prototipo de artillería autopropulsada de blindaje potente diseñada para el ejército de Estados Unidos durante la Segunda Guerra Mundial. El T28 fue rebautizado y categorizado en 1945 como el transporte motorizado T95 con cañón de 105 mm. When you first play the T28, you will notice that it is much slower then the T25 AT. This tank is a bit faster than the T95, but not by much, so both tanks are easy prey for artillery and fast tanks. The frontal armor is very good for its tier, unlike that of its turreted brother the T28 Prototype, although the lower part of the armor is weaker. The 120mm AT gun can bring down even the strongest opponents with its rapid fire and good damage and accuracy. The only things the driver needs to worry about are its side and rear armor, as they are quite thin, allowing quick movers to take you down with ease. Be patient, stay in cover, and provide support for your allies and the T28 will prepare you greatly for the monster T95. Can be a surprisingly decent brawler with the correct crew, skills, and situation when fully upgraded and as top tier. As such, this tank, unlike the T95 with its extreme frontal armour, cannot really lead a spearhead unless it is top tier. Instead, it should function as a support sniper at mid range, where its small silhouette, large gun mantlet and good accuracy can be an advantage, and the 203mm of armour can start bouncing too. Compared to the T28 Prototype, this tank doesn't have a turret and little gun depression, but each of its guns have a ~9% increase in rate of fire, a 0.01m accuracy buff and a 0.2 second faster aim time on the top gun. Thus while the Prototype makes a good sniper, this tank is more suited to going closer to the front lines, where it can quickly deploy its firepower to the team's advantage. When at top tier, a fully upgraded T28 can become an surprisingly effective street-brawler if the Driver possesses the Clutch-Braking skill and the tank is equipped with a tank gun rammer. This playstyle can mainly be achieved deep in urban areas where buildings can provide barriers against artillery shells. Try to keep your sides and rear as little exposed to the enemy as possible constantly remain on the move, only stop when attempting mid-range shots and make sure you have team mates close by who can cover you if an enemy manages to slip into your side. Similarly to the T95, the T28 CAN potentially bounce arty shells, but in the T28s case, only from pesky FV304s, and infrequently, as with the T95. You may have the Tier X radio from other lines and the 105mm from the T25 AT, but you will need to equip the tracks to be able to mount the 120mm. Then you should research the engine, which is the same one that is in the T95. The rejected M6A2E1 project proposed that a limited number of assault vehicles be improvised by modifying the stock of T1E1 heavy tanks. However, a far more extensive program to develop a heavily armed and armored combat vehicle had been initiated in September 1943. Studies by the Ordnance Department indicated that such a vehicle would be required after the invasion of Europe to penetrate heavily fortified areas such as the German West Wall. The original concept proposed mounting the new 105mm gun T5E1 in a tank with the equivalent of 8 inch frontal armor using the electric drive system developed for the heavy tank T1E1 and the medium tank T23. The high velocity T5E1 gun had excellent penetration performance against concrete and when installed in a heavily armored chassis was expected to be extremely effective in reducing heavy fortifications. The Chief of Ordnance proposed that 25 of the new tanks be produced and estimated that they could be completed in eight to twelve months, approximately the same time that would be required to build a single pilot. Such a schedule was expected to make them available in time for operations in Europe. The Army Ground Forces did not agree and recommended that only three pilot models be constructed and that the electric drive be replaced by a mechanical transmission. After a conference with the various parties concerned, the Army Service Forces in March 1944 authorized the procurement of five vehicles, designating them as the heavy tank T28. The original specification was modified to increase the frontal armor to 12 inches raising the estimated combat weight to 95 tons. The proposed tank was a low silhouette vehicle without a turret. The 105mm gun T5E1 was to be mounted in the front of the hull with a traverse of 10 degrees to the right and left of center and an elevation range of -5 to +20 degrees. 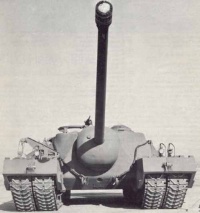 The power package in the T28 (T95) was essentially the same as in the M26 Pershing tank, although the weight of the new vehicle was more than twice that of the latter. To handle the T28 (T95), the 500 horsepower Ford GAF engine and the torqmatic transmission required a final drive gear ratio that reduced the maximum vehicle speed to about eight miles per hour. In fact, the maximum recommended sustained speed was seven miles per hour at 2600 rpm. Due to its extreme weight and low engine power, the T28 (T95) had extremely limited obstacle-crossing ability and could not cross any of the portable bridges available at the time. The great weight of the vehicle also required considerable ingenuity in design to reduce the ground pressure to an acceptable level. This objective was achieved by the use of two sets of tracks on each side. 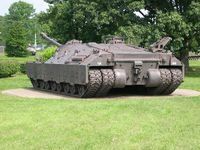 The outer set, along with the four inch thick armor side skirts, could be removed and towed behind the vehicle when operating on a hard surface. Removing the outer tracks also reduced the overall width from 179 1/2 inches to 124 inches permitting rail transportation. At Aberdeen, an inexperienced four man crew removed the outer tracks under field conditions in four hours on their first try. An equal amount of time was required to reassemble them onto the vehicle. By the third try, the same team had reduced the time to remove or replace the outer tracks to 2 1/2 hours. A crew of four was carried with the driver and gunner in the front hull on the left and right of the cannon respectively. The loader was at the left rear of the fighting compartment and the commander at the right rear behind the gunner. The driver and the commander were each provided with a vision cupola. A ring mount for a .50 caliber machine gun was installed around the commanders cupola. It could be used only with the commander standing in the open hatch and was the only secondary armament on the vehicle, except for the individual crew weapons. The gunner was equipped with a telescope alongside the cannon and a periscopic sight in the hull roof. 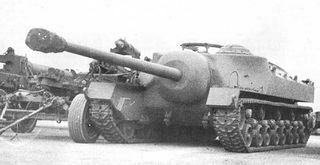 On 7 February 1945, a memorandum from the Chief of Ordnance requested that the T28 be redesignated as the 105mm gun motor carriage T95 because the cannon was not turret mounted and because of its limited secondary armament. OCM 26898, dated 8 March 1945, approved the name change and recorded the characteristics of the new vehicle. Because of the pressure of the wartime production program as well as the size and weight of the proposed vehicle, there was some difficulty in finding a facility to manufacture the five pilots. However, the Pacific Car and Foundry Company agreed to take on the project and in May 1945, (they were supplied with the basic vehicle design as well as detailed information on the gun mount and the horizontal volute spring suspension. Final design work began immediately. The first front end casting was delivered on 20 June and welding was completed on the first hull in August 1945. After the end of the war in the Pacific, the number of pilots was reduced from five to two with number 1 being shipped to Aberdeen Proving Ground on 21 December 1945 followed by number 2 on 10 January 1946. The first pilot, registration number 40226809, was used for engineering tests at Aberdeen, but the second, registration number 40226810, was transferred first to Fort Knox and later to the Engineer Board at Yuma, Arizona where it was used for testing floating bridges. The heavily armed and armored T95 did not quite fit any of the usual categories for U. S. Army fighting vehicles. For example, tanks were expected to carry their armament in fully rotating turrets and self-propelled guns usually were lightly armored to achieve maximum mobility. The T95 did not meet either of these criteria and in June 1946, there was another name change. At that time, OCM 30758 redesignated the vehicle as the super heavy tank T28. It then was considered that the combination of heavy firepower and heavy armor was more appropriate for a tank than a gun motor carriage. Regardless of the name, the T28 (T95) was under test at Aberdeen Proving Ground until late 1947, primarily to evaluate the durability of components on such a heavy vehicle. A total of 541 miles of operation was completed consisting of 128 miles on roads and 413 miles on gravel. Needless to say, the mileage accumulated slowly because of the low normal operating speed of five to six miles per hour and the low priority assigned to the project. Work was terminated before completion of the program in compliance with a War Department policy to discontinue development on combat vehicles in the 100-ton class. 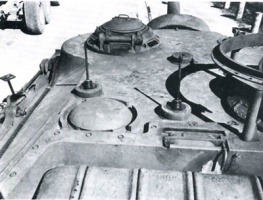 In 1947 one of the T28 (T95)'s was heavily damaged by an engine fire during trials at Yuma Proving Grounds and scrapped, and the other T28 (T95) was reported broken up and also sold for scrap. In 1974 the last prototype was discovered abandoned in a back field at Fort Belvoir, Virginia. It is unknown where it spent the intervening 27 years. It is the sole remaining example of these tanks and was exhibited at the Patton Museum of Cavalry and Armor in Kentucky. Zaloga, S.J., 2005, US Anti-tank Artillery 1941–45, New Vanguard Series 107, Osprey Publishing, Oxford, 48p, ISBN:9781841766904. T28 Photos & history on the T28 Gun Motor Carriage. Esta página fue modificada por última vez el 25 oct 2016, a las 10:44.